It is really starting to feel like September and Fall where I live, yaaaaayyyyyy! Fall is the best and I LOVE the nail colors this time of year. 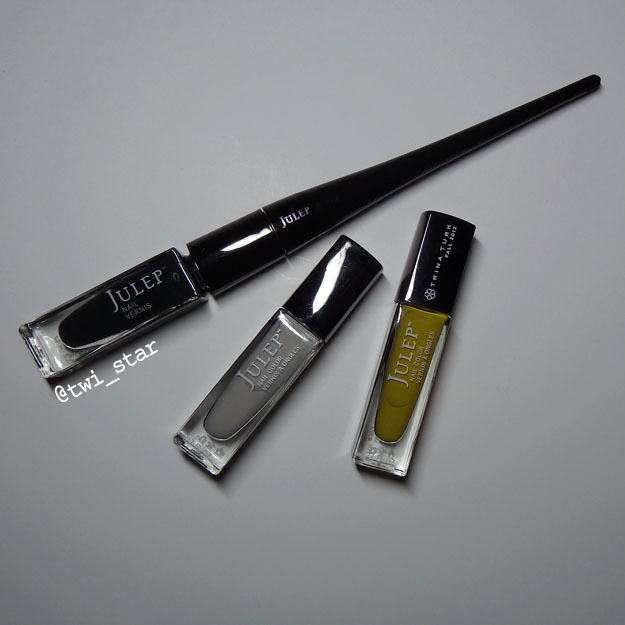 I’ve been waiting to wear one of my fav Juleps again, Alma. Alma is from the Trina Turk Fall 2012 collection, one of my all time fav Julep collections. Alma is one of those fugly type colors, it’s a mustardy green tinged crème. I know a lot of peeps don’t like these type of colors but I dig them. 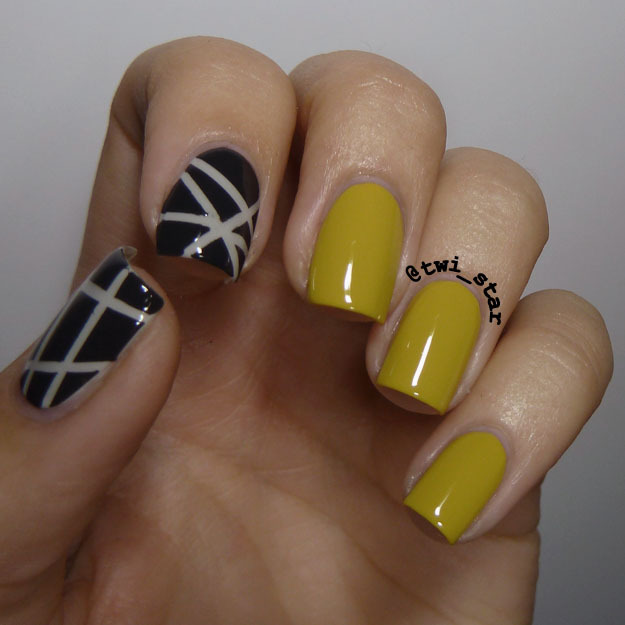 I saw a mani on Instagram that inspired me to bust out my striping tape, this one by @nailsbyic. The colors she used are totally different and I started out picking similar colors but then one thing lead to another and I ended up with a different color scheme! Love, love, love Alma. So friggin fugly haha! A good formula, nice and opaque in 2 coats. I used Julep Winter as the base, cool leaning neutral sky cloud gray. I used 2 coats. Here is a close-up of the thumb. I placed overlapping strips of nail striping tape and then put one coat of Julep Brandt over before pulling the tape off while Brandt was still wet. Brandt is an off-black crème, I use it often when I don’t quite want the harshness of a true black. I probably should get a backup bottle, and I never buy backup bottles. Brandt is also from the Trina Turk Fall 2012 collection. I think this pic shows Alma the best. Just a hint of green to her. Here are the colors I used all artfully arranged lol and my Julep plie wand, which I love! I think I’m a decent painter but the plie wand helps to lay the color down nicer and gives me a good clean line along the nail sides. 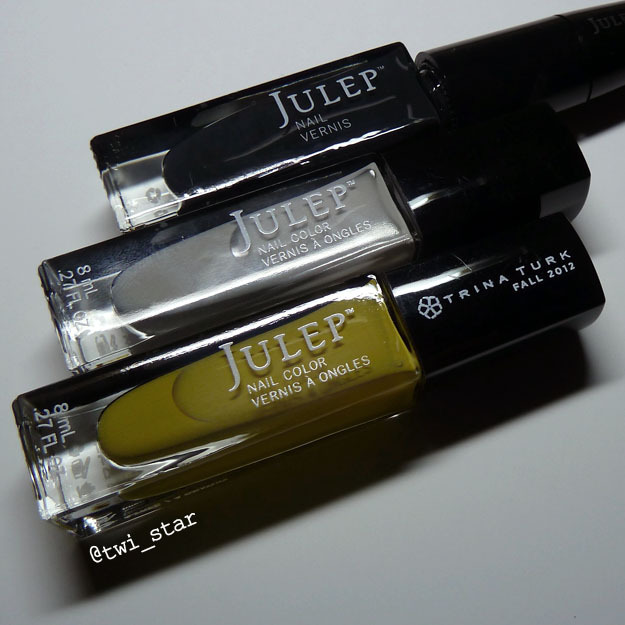 I use it every time I paint my nails with Julep polishes. I’m officially in the Fall mood now!